“It’s so simple,” he said. “But so delicious. It’s eggs with peppers and tomatoes and onions. And it’s all mixed up.” A not-very-attractive image conjured itself up in my mind. Was menemen going to resemble some sort of sloppy scrambled eggs with tomatoes? 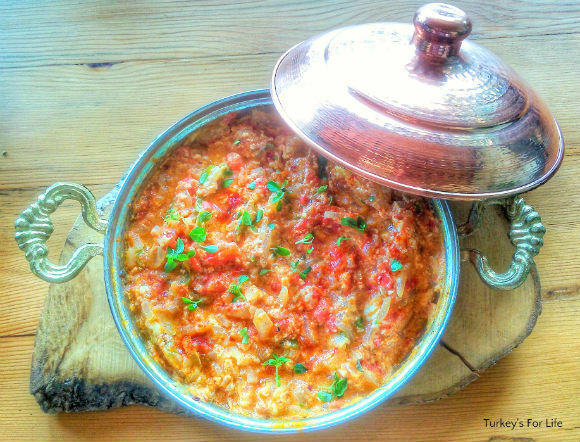 When we caught our first sight of menemen on that same holiday, those thoughts were confirmed! These Turkish scrambled eggs were not looking too appealing at all… But then we tasted menemen! And wow! The eggs and tomatoes with the peppers and onions; a perfect combination. And the flavours were so good that this Turkish breakfast recipe was now, on sight, a complete tempter. These days, hardly a week goes by where we don’t make menemen! And not just for breakfast, either. No. Menemen can be eaten at any time of day! On some English menus, menemen is sometimes translated as ‘Turkish omelette.’ As with many other translations of famous Turkish dishes (gözleme springs to mind), this is really not a favourite description of ours. But if you do see those words on a menu and you decide to order it, you’re gonna get something resembling our photo above. 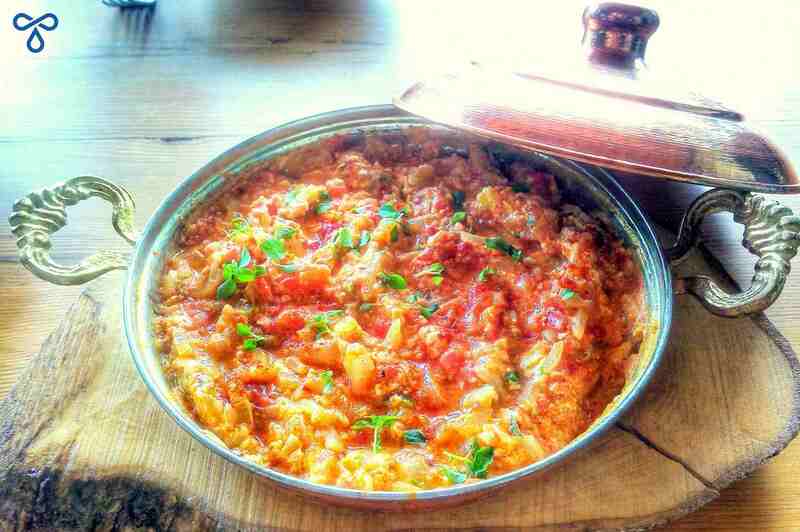 Authentic Menemen is more of a Turkish scrambled eggs recipe than it is an omelette. Anyway, how to make menemen? Well, it’s very easy. And it seems, from a recent poll on Twitter, that you can either do your menemen recipe with onions or without onions. We’ve always been a with onions kinda couple but you can decide for yourself. Famous Turkish food critic, Vedat Milor, asked the question on his Twitter account. A massive half a million people felt compelled to cast their vote. And the result? 51% prefer their menemen recipe to contain onions. 49% without. Vedat Milor is in the 51% category, as are we. So, let’s make menemen…with onions. We don’t want the onions to be too crunchy or burned. So, first of all, we sweat them and then saute on a low heat until they start to soften and go translucent. Our Turkish egg pan has a lid so we cover them for a few minutes. Then we add green pepper and stir that in. We use sivri biber (the long green peppers) but a bell pepper will do the trick if you can’t get sivri biber. After our onions and peppers have cooked for a few minutes, we add a large, chopped tomato. If you know Turkish summer tomatoes, you’ll know they’re pretty meaty and sizeable. 2-3 medium-sized tomatoes will be necessary, depending on how tomato-ish you want your menemen to be. And then we add our spices and season with salt and freshly ground black pepper. Again, spices are a matter of personal taste. We use sweet paprika, kekik (oregano and thyme), cumin, and, of course, chilli flakes. A spicy menemen is essential, for us. If you’re a cheese lover, some menemen recipes also contain some crumbled feta cheese. You can add this at the same time as your eggs so that it melts a little as you stir the mixture. This isn’t to our taste so we skip the cheese. And once our tomatoes have softened and we have a tomato sauce in the pan, it’s time for the eggs. Village eggs, for us. Some people choose to cover the pan again at this point and let the eggs poach (similar to when you make spinach and eggs) but we go with the more common scrambled route. 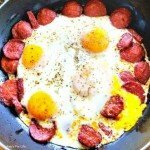 One pan eggs, Turkish style! Menemen is healthy & filling and works as a breakfast recipe or a dish that can be eaten at any other time of day. Add a small glug of sunflower oil to a frying pan and heat gently. First of all, add your onions and saute for a few minutes until they become translucent. Now add your green pepper and stir for a few minutes until it starts to soften. Now stir in your chopped tomato and add your herbs and spices and salt and pepper. Simmer over a low heat until your tomato cooks down to form a thick tomato sauce. Crack your eggs into the pan and stir them until they are scrambled into the mixture. Remove from the heat and garnish with your parsley. Serve alone or as part of a larger breakfast. As with all of our recipes, calories are approximate and will differ depending on your ingredients. Turkish summer tomatoes are very large, hence we use only one. They are equivalent to 3-4 medium-sized vine tomatoes. If you want a richer flavour, you can add some crumbled feta cheese to your menemen recipe at the same time as your eggs. And that’s how we make our traditional Turkish menemen. One pan eggs that are guaranteed to satisfy – especially as a weekend brunch treat. Could you eat menemen and resist fresh crusty bread? Unlike another favourite Turkish egg dish of ours, sucuklu yumurta, there’s no need to feel too guilty when you’re eating menemen as it’s really healthy. You can always increase the comfort food levels, though, by eating your menemen with some fresh crusty bread from your local bakery. Difficult to resist when all those juices are waiting to be mopped up! For this recipe and other Turkish recipes to cook at home, visit our ever growing Turkish recipe collection.